I don’t often purchase dairy goods at Target. Today was an exception. Usually I head to Target for videos, office supplies, gift cards, Halloween decorations and so forth. On this occasion I needed some shipping boxes, birthday napkins and eggs. Rather than stop at two stores I decided to get the eggs at Target. So why the posting? 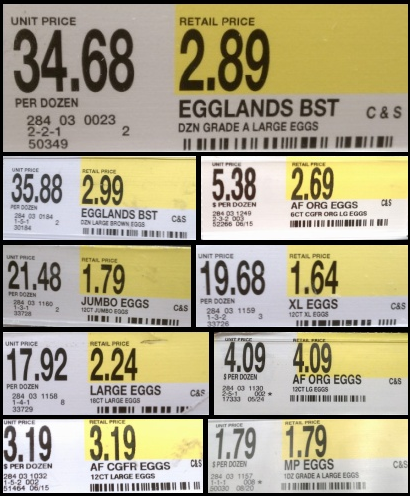 Well, either my math skills are getting really poor (probably due to my relentless exposure to computers and calculators) or Target has some issue with understanding egg pricing. Here are pictures of the price labels in the dairy section (taken at the Target in Clifton Park, NY on September 3, 2012). Anything look askew? Now, if the errors were consistent I guess I could understand. After all converting from “12 eggs” to “price per dozen” takes some understanding of the word “dozen” along with the principle of unit pricing. What I find interesting is that the unit pricing calculation for these eggs is somewhat cracked since it does not seem to follow a pattern. Also, apparently no one has noticed these strange unit prices.